Unsold EUR 177,69 0 Bids or Best Offer, EUR 47,13 Shipping, Pay with PayPal and you're fully protected. 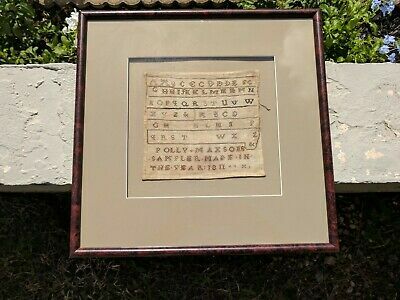 Seller: mrmike9147 (114) 100%, Location: Cape Coral, Florida, Ships to: US & many other countries, Item: 264193504237 You are bidding on a Beautiful Antique 1811 Embroidery Sampler Handmade Cross Stitch (POLLY MAXSONS) Antique. The sampler itself is 8 x 7.5 inch. I found this at an estate sale. it looks like the letters had color on it but it has faded. I do not know anything about the person that made it. If you have any questions please send me a message. Buyer to pay priority shipping to your ZIP code. Thank you for looking and good luck bidding. Popularity - 94 views, 1.3 views per day, 70 days on eBay. High amount of views. 0 sold, 1 available. 94 views, 1.3 views per day, 70 days on eBay. High amount of views. 0 sold, 1 available.